I am not surprised by those vituperations by Mr. Speaker of the Kwara House of Assembly against our amiable leader, President Muhammadu Buhari. It is the hand of Esau but the voice of Jacob. Mr. Speaker. I shall speak to you directly. 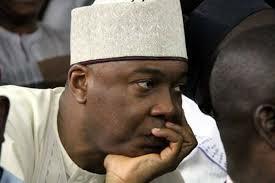 Your paymaster - Senate President Bukola Saraki - is on his final gasp. Years ago, in Ilorin, my father in-law was down with serious diabetics attack. We quickly called in some endocrinology experts based on the advice from my daughters who were then in medical college. I will never forget what those Doctors told us: that just before death we might see a surprising surge of energy in him, something doctors refer to as "terminal lucidity". They cautioned us that this would not be a sign of strength, but rather that death was near. Sure enough a few weeks before his death, he was out of bed and had a surprising amount of energy. It was a last gasp at life. He died shortly after that. That is what 2019 represents for Senate President Bukola Saraki politically both in Kwara and in Nigeria at large. I am not surprised by his various struggles and maneuvering. Those struggles are symptoms of Bukola Saraki's "terminal lucidity". He is on his last gasp.